You probably know how to eat Brussels sprouts, right? Just politely push those little cabbage cubs around your plate. Then pretend to forget them. Well, good news: You can stop playing with your food now. Because Roast Brussels Sprouts are actually edible. Delicious, even. I know you may find that hard to believe. But that’s probably because the only Brussels sprouts you’ve encountered have been overcooked. As in, boiled to death. And the truth is, if you cook Brussels sprouts too long, they turn into a stinky mess. Nobody wants to eat a vegetable that’s been so badly mistreated. Unlike lengthy boiling, roasting brings out the best in Brussels sprouts. Roasting deepens and concentrates flavor, highlighting an inner sweetness that boiling obscures. And roasting reveals hidden depths of flavor that most people find irresistible. It’s a good thing Brussels sprouts are plentiful and inexpensive in the fall and winter, so you can indulge in your new favorite vegetable. And with Thanksgiving later this week, they’re a great green veggie choice for your festive dinner. Roasting is one of the easiest ways to cook this healthy and nutritious vegetable. And they taste so great, even your most finicky eater will be asking for seconds. Maybe thirds. Roasting Brussels sprouts (or most other vegetables) is simple: Just toss cut-up veggies with olive oil, salt, and pepper before popping them into the oven. Include some herbs or garlic if you want to add a bit of flavor interest. You can roast almost any vegetable at oven temperatures ranging from 300 to 500 degrees F. I prefer 400 - 425 for Brussels sprouts. They take longer to cook at lower temperatures, while at higher temperatures they have a tendency to char somewhat (which I sometimes regard as a good thing, although if you overdo it they may develop some of the flavor characteristics that people find unpleasant). You can roast Brussels sprouts whole, but I find they cook faster and more evenly if I cut them in half lengthwise, or even into quarters. I usually figure a pound of Brussels sprouts will yield 4 to 6 servings. But people often want seconds on this dish, so adjust accordingly. It’s easy enough to double or triple this recipe, if necessary. I prefer to buy Brussels sprouts loose so I can select ones that are all the same size. In the fall, you can also buy them on the stalk, which is rather nice. Many supermarkets sell Brussels sprouts in little baskets. Be aware that these often contain about 10 ounces of Brussels sprouts, enough for 4 smallish servings. This recipe serves 4 and takes 5 to 10 minutes of preparation time, plus 20 to 25 minutes oven time. You probably won’t have leftovers. But if you do, they’ll store well in a covered container in the refrigerator for a few days. Wash Brussels sprouts and trim off any discolored leaves. Trim about 1/8 of an inch from the stem – just enough to remove any discoloration. Cut each head in half lengthwise, or into quarters (you want them to be bite-size). Place Brussels sprouts in a large bowl. Add olive oil and salt, pepper, and optional herb to taste. Toss to coat the sprouts with oil and flavorings. 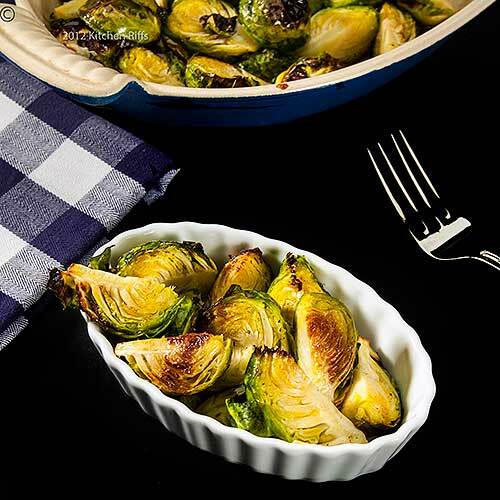 Spread the Brussels sprouts on a large rimmed baking sheet or in a casserole baking dish. You want the pieces to be in one layer, and not touching (to promote even cooking). Use a baking sheet/dish that’s just large enough to hold the sprouts in one layer. Don’t worry when some of the leaves fall off (they always do); they’ll just brown up and become deliciously crisp. Roast for 10 minutes, then stir or toss to turn over and promote even cooking. Continue roasting until they are tender throughout, but not mushy. At 425 degrees, this usually takes 20 to 25 minutes, so I start checking at 20 minutes. If you want a bit more char on your Brussels sprouts, run the baking pan under the broiler for a few minutes until you achieve the result you desire. Taste, adjust seasoning, and serve. I often sprinkle balsamic vinegar on my sprouts before serving. When buying Brussels sprouts, look for ones that are bright green with tight, compact heads. You don’t want to see heads that are discolored (yellowed) or with loose leaves. If you’re roasting meat, this dish (or any roast vegetable) is an ideal accompaniment, because it will cook at any temperature you’re likely to use for cooking the meat. Oven temperature affects how quickly Brussels sprouts roast. At 500 degrees, it could take as little as 15 minutes (though 20 is usually more like it). At 300 degrees, they may need 40 minutes or even longer. So test early and often to determine when your Brussels sprouts are done. After oven temperature, the factor that will most affect roasting time is the size of your Brussels sprouts. So although you don’t have to cut them into halves or quarters, remember that they’ll take longer to roast if you don’t. You can use more or less olive oil than called for in Step 3, depending on the flavor you want. If you prefer a really low-fat dish, you can get by without using any olive oil, although the Brussels sprouts will be somewhat dry, and also less flavorful. If you go the “no olive oil” route, spray the baking sheet with baking spray to reduce sticking. But extra virgin olive oil has wonderful flavor. 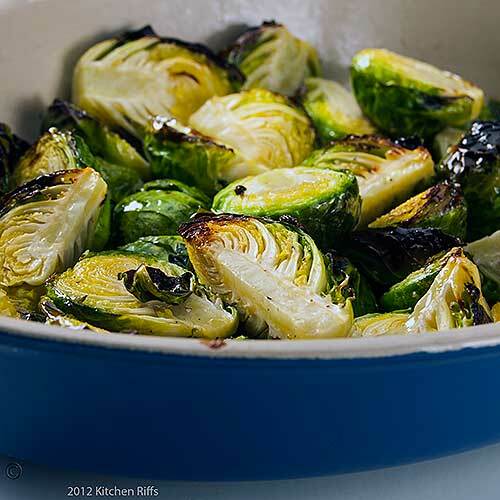 So you may want to sprinkle some on the Brussels sprouts when you remove them from the oven to boost their flavor. Sprinkling balsamic vinegar over the Brussels sprouts just before serving is another nice flavor boost. Brussels sprouts are also terrific when combined with smoky flavors, like bacon. Sauté some bacon pieces while the sprouts are roasting, then add the bacon (along with a bit of the rendered fat) to the sprouts when they’re ready to serve. Another way to boost flavor is to add some minced garlic to the Brussels sprouts in Step 3 when tossing with oil. Two or three cloves of garlic is about right, IMO. You can also add fresh or dried herbs (I like dried thyme) or spices. Use about 1 teaspoon (half that if you want only a hint of flavor) and toss with oil in Step 3. Brussels sprouts (or their close kin) have been around for thousands of years. An ancestor probably was grown in Rome at the time of the Caesars. Nowadays, they’re most often associated with Belgium (in French they’re called choux de bruxelles, or “Brussels cabbages”). The Brussels sprouts we know today date back to the 16th century. Brussels sprouts handle frost well, so they’re particularly tasty in late fall and early winter. In the US, we celebrate Thanksgiving this Thursday. And as soon as we clear our plates, many of us will start thinking about the winter festivals of Christmas and Hanukkah. It’s a time of year when people entertain family and friends, so they’re looking for special treats to serve. And here at Kitchen Riffs, we’re ready to help! Over the next few weeks, we’ll be featuring recipes for two holiday favorites: cookies and cocktails. Why cookies? Because even people who seldom bake (or eat) them are likely to do both as Christmas approaches. And cocktails? Because in the US, December is the biggest sales month of the year for liquor stores as we all stock up to celebrate the season. So beginning next week, we’ll feature a cookie and a cocktail every week. You may be familiar with some of the recipes, but I can almost guarantee that others will be new to you. And you'll want to make them all. Glad to see you back! I am with you - roasting brussels sprouts brings out their best! It's good to see you back, John. Oh I love me some roasted Brussel sprouts! We add a little bacon sometimes and they get all delicious and crispy! Thank you for sharing this, John! I have never, ever made brussel sprouts, and I've only ever tasted them when they've been pulverized to an unappetizing mush. I may have to go out and buy the club-like stalk now, though! I hope everything is going well on your end, and that you're all taking care. It's great to have you back. I always look at the brussels sprouts at the market and wonder how they would come out if I was to prepare them. I know now! I enjoy your style of writing and information you share concerning the recipe at hand. These look absolutely delicious!! I cannot wait to see your cookie recipes! Welcome back. I have never cared for brussels sprouts, but have always had them boiled. I will have to try them roasted. Your pictures make them look so yummy! Hi Alyssa, glad to be getting back on schedule. Thanks for your comment. Hi Uru, yes you do. ;-) Thanks for the comment. Hi CJ, I make Brussels sprouts at least a half dozen different ways, but this is definitely one of my favs. Thanks for your comment. Hi Sarah, thanks for that. Hey, if you don't like Brussels sprouts, you don't like them. And they are terrific roasted. Not that you'll ever know. ;-) Thanks for the comment. Hi Clare, Brussels sprouts and bacon is an awesome combo - I love it! Thanks for the comment. Hi Anne, no need to apologize - I love them too! Although when I was a kid I hated them (they were always overcooked). And isn't that char really good stuff? ;-) Thanks for the comment. Hi Ala, these are definitely worth trying. And add leftover roast sprouts to a stir-fry - they're great. Everything is find, but thanks so much for your concern. And for your comment. Hi Kim, you'll thank me. ;-) Really. Now put that blow torch away. Thanks for the comment. Hi Judy, just don't overcook them and you'll like them. And I'm excited about the cookies too - some good recipes coming! Thanks for the kind words, and for taking time to comment. Hi Dawn, thanks. They're a different veggie when roasted. They're also really good in a stir-fry - try them with some fermented black beans and pork (that was dinner tonight, and was really good). Thanks for the comment. Hi John, aren't Brussels sprouts great? I'll eat them any which way. But you make a good point about keeping them our secret - we don't want to drive up the price if too many people start demanding them! Thanks for the comment. I am one of those who are not keen on brussel sprouts. I can eat them but it's an effort. Next time I will try roasting them with a few herbs and garlic on top. Maybe they will be bearable then. By the way, your comments on my blog all went into SPAM, which is ridiculous, but perhaps you should check if that is happening on other blogs too. Honestly I remember only having once brussel sprouts, but most probably it must have passed the dinner table a couple of more times, just that I don't remember. I remember that one time simply because I didn't like them and I was a kid, which explains all because I don't know a child that likes the flavors of the sprouts. Loved your tips and they r going to come handy! thanks for sharing! I am actually one of the few people that like eating brussel sprouts! Not sure why, because I'm plenty fussy about other foods, but I quite enjoy them. 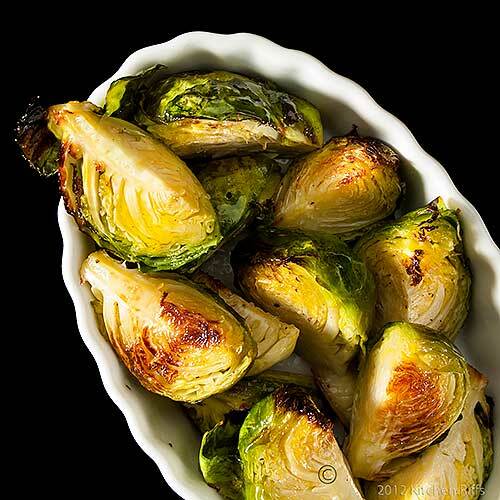 Your roasted brussel sprouts look great! I actually love brussel sprouts! But I have never tried them roasted, this sounds great! Hi Suzanne, thanks for the heads up about SPAM - these filters seem to only partially work, don't they? Anyway, if Brussels sprouts aren't your thing, do try them with some balsamic vinegar - it really helps mellow them. Thanks for your comment. Hi Raymund, isn't roasting nice? It gives such a nice, rich flavor. Thanks for the comment. Hi Helene, it might be that most kids just can't appreciate the flavor of sprouts - it does take awhile before our taste buds mature and appreciate some flavors (or so I've read). Interesting observation. Thanks for the comment. Hi Ali, don't they have a great flavor? And the only thing better than Roast Brussels Sprouts is leftover roast sprouts! Thanks for the comment. Hi Cathleen, they're really worth trying roasted sometime. But it's the rare veggie that isn't great when roasted. Thanks for the comment. Hi Judy, isn't roasting great? It's become one of my fav ways to prepare almost anything, it seems. And you're right - bacon and balsamic improve almost anything! ;-) Thanks for the kind words and the comment. We do like brussels sprouts and "we" meaning just me and the mrs. Kids wouldn't touch these veggies. However, I have never roasted them before, so your procedure may change some of these brat's mind -- we'll see. Hey John, you and the family have a wonderful Thanksgiving. Hi Ray, if roasting doesn't change the minds of your kids, you'll just have more to enjoy! ;-) Thanks for commenting, and Happy Thanksgiving to you and yours, too. John - thank you for this! B and I are two people that think they don't like brussel sprouts, but then we had them at a restaurant about a year ago and loved the dish! They had been roasted. I've been wanting to try the dish ever since and yesterday the co-op had some beautiful b. sprouts!So perfect timing! I definitely would add the garlic and thyme because I love those flavors. Thanks for the recipe and all your wonderful notes. Who knows - I might actually say "I like brussel sprouts" some day soon! Hope you and Mrs. KR have a wonderful holiday weekend!!! Hi MJ, I hope you and Bobby enjoy this! I like Brussels sprouts lots of ways, but roasting is the best. The addition of garlic really is nice. I hope you have a great holiday too, and thanks for the comment. I am treating myself to my own batch of Brussels sprouts tomorrow. And you've convinced me to roast them :) Happy Thanksgiving! Hi Lizzy, Brussels sprouts are a tradition on many people's Thanksgiving tables. ;-) I love them roasted, and I hope you do, too. Thanks for the comment. Hi Kristi, Brussels sprouts are really great this way! Do try them with balsamic vinegar and/or bacon if you're in the least doubt about how much you'd like them. Thanks for your comment, and Happy Thanksgiving! Hi cakewhiz, I used to be one of those who pushed the Brussels sprouts around on my plate too! If you like balsamic vinegar, you'll love how well it combines with roasted Brussels sprouts. Thanks for the comment, and Happy Thanksgiving. New cookies every week? I am so in! I'm looking forward to this feature. And your brussels sprouts look awesome - much better roasted than boiled. Hi Beth, some good cookie recipes coming up. ;-) I don't actually remember the last time I had a boiled Brussels sprout - there are so many better ways to cook them. Thanks for your comment. I didn't like brussels sprouts either until I ate them roasted and topped with buttery, garlicky toasted breadcrumbs. Yours look beautiful. Hi Maureen, garlicky breadcrumbs are a great idea! In fact I think I'll borrow it next time I do these. Thanks for your kind words, and your comment. I've never really understood people who didn't like brussel sprouts...they go so well with bacon. :P Your version looks so appetising, it's making me drool! I'm not a huge fan of brussels sprouts but I adore them roasted! The crunchy edges are simply wonderful. Hi Jenny, Brussels sprouts have such an affinity for bacon, don't they? Of course there are few dishes that aren't improved by bacon! Thanks for the comment. Hi Kristy, Doesn't roasting bring out such tremendous flavor in them? The best way to prepare them, IMO, though stir-frying is pretty good too. Thanks for the comment. Hi Bam, roasting is a great way to prepare Brussels sprouts. You might also want to substitute them for cabbage in any stir-fry; they take particularly well to Asian flavorings, IMO. Thanks for the comment. Hi Terra, I've been there, done that with moving those little cabbages around on my plate! Then I, too, discovered how great they could be. Just don't overcook them and they taste mighty fine. Thanks for the comment. And, third: thanks for the tip on liquor sale. I had no idea that such sale exists. Hi Marina, I definitely have to check out your Brussels sprouts post! And how can someone not eat sweets around Christmas time? Love your comment - thank you so much! This by far my favorite way (and only way!) of eating brussels sprouts. I never liked them before and roasting them makes them divine! 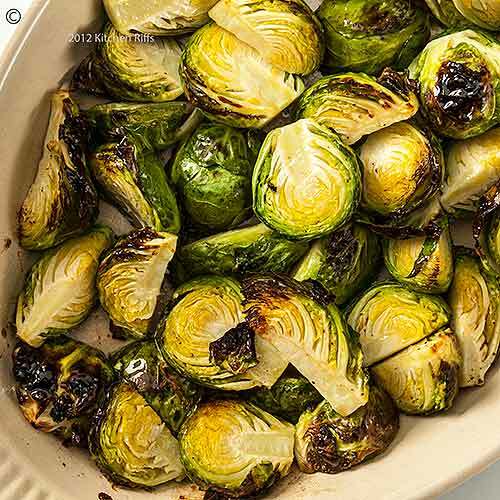 Hi Laura, roasting is my favorite way to eat Brussels sprouts too! They become really good stuff. Thanks for the comment. Hi Christine, boiled Brussels sprouts can be good if they're still al dente and not overcooked, IMO, but otherwise they're not all that pleasant. It's pretty hard to mess up roasted Brussels sprouts! Thanks for the comment. I love brussels srpouts any way I can get them lol even slightly boiled (yes I'm a weirdo). Totally agree though, roasting them is one of the best ways around to cook em, looks gorgeous. Hi Food Jaunts, boiled Brussels sprouts are actually OK if they're still a bit crunchy, IMO. But roasting is definitely better! Thanks for the comment. Roasted Brussels sprouts are so delicious. I've been a fan of them for a long time and never really understood how they got a bad reputation...until one day. I was making them at home and got distracted and forgot all about them. Long story short, I overcooked the Brussels sprouts so badly that my entire home smelled awful for a few days. It definitely prevented me from having any friends over. Anyways, I'm so glad that you posted exact times for roasting. I can set the kitchen timer and not have that problem again. P.S. I love your idea of finishing them with Balsamic vinegar! Yum! Hi Anne, I don't blame you for not wanting to repeat that experience! Ovens do vary a bit so I always set for timer to go off a little bit early (and of course smaller sprouts will cook just a bit quicker than larger ones). But this method is about as foolproof as it gets. Thanks for the comment. Every recipe I have found for Roast Brussel Sprouts includes black pepper. Is there a particular reason for this? I want to try them roasted but I cannot do the black pepper. We have it in our house only in case a visitor might want to use it on their food. Salt, garlic, other herbs, yes. Black pepper, no. Would white pepper work? or does it even have to have the pepper? Thank you. Hi Katy, although lots of foods have their flavor enhanced by adding salt and pepper, there's no need to do so; it'll just taste really good. In this case the recipe says season to taste — and in your case, no pepper is to your taste! White pepper is just the fully ripe form of black pepper (black pepper, as I recall, is picked green, then allowed to dry — this turns it black). So if black pepper is no-go, white pepper probably would be too. Anyway, skipping the pepper and adding a bit of garlic, or maybe a squeeze of lemon, would be might tasty. Thanks for the comment.